Confocal immunofluorescent analysis of A172 (left, positive) and MCF7 (right, negative) cells using N-Cadherin (D4R1H) XP® Rabbit mAb (Alexa Fluor® 488 Conjugate) (green). Blue = DAPI #4083 (fluorescent DNA dye). 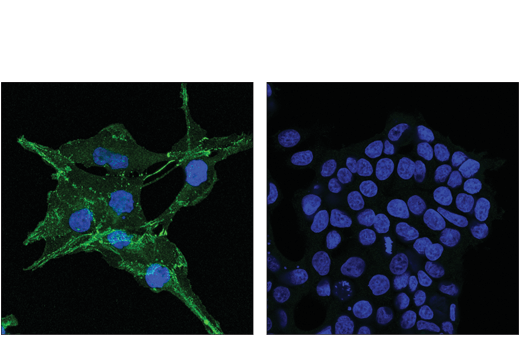 N-Cadherin (D4R1H) XP® Rabbit mAb (Alexa Fluor® 488 Conjugate) recognizes endogenous levels of total N-cadherin protein. Some non-specific staining has been observed in mouse kidney tissue. Monoclonal antibody is produced by immunizing animals with a synthetic peptide corresponding to residues surrounding Arg526 of human N-cadherin protein. This Cell Signaling Technology antibody is conjugated to Alexa Fluor® 488 fluorescent dye and tested in-house for direct immunofluorescent analysis in human cells. This antibody is expected to exhibit the same species cross-reactivity as the unconjugated N-Cadherin (D4R1H) XP® Rabbit mAb #13116.